Coleman Waters with a pin in the consolation match. He needs Colon to win to get a wrestleback against Portillo. Colon leads Portillo 2-0 entering the second period. Start neutral. Colon TD and Portillo reversal. Colon leads 4-2. Portillo leads Colon 5-4 entering the third. Portillo chooses down. Portillo reversal for a 7-4 lead. Colon in trouble then gets a reversal. Josh Portillo up 7-1 on McDonough in the 113 championship. 106 championship in Britt: Justin Portillo (C-G) dec. Jeremiah Colon (Newman), 11-7. Josh Portillo wins at 113. Newman's Tyler Paulson wins the 113 third-place match by fall in 1:13. No wrestleback at 113. 120 final has Andrews up 2-0. He is facing Lienemann of C-G.
113 final in Britt: Josh Portillo (C-G) pinned Marcus McDonough (Central Springs), 1:24. Matthew McDonough up 12-1 in the third-place match. McDonough with the pin. He needs Lienemann to win for a wrestleback. Andrews is the sectional champ with a major decision. 120 final in Britt: Zach Andrews (B-K) major dec. Lucas Lienemann (C-G), 10-1. JD Sliger with a pin at 126 in the third-place match. 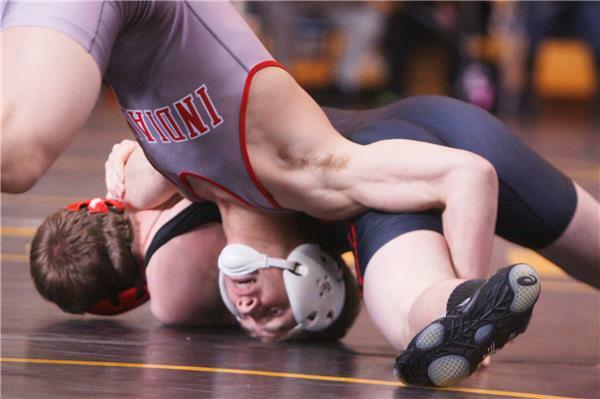 He needs Michael Olsen of Lake Mills to defeat Joel Habermann of Clarion-Goldfield for a wrestleback. Haberman leads Olsen 12-4 late second. 126 final in Britt: Joel Haberman (C-G) major dec. Michael Olsen (Lake Mills), 16-5. Tanner Heaberlin (B-K) vs. Ethan Blanchard (CS) at 132. 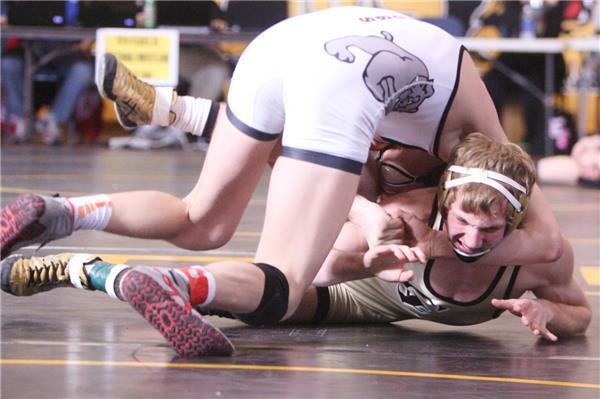 Krister Beal (LM) won by injury default over Calen Rosenbaum (C-G) in the 132 3rd-place match. Heaberlin and Blanchard no score after one.